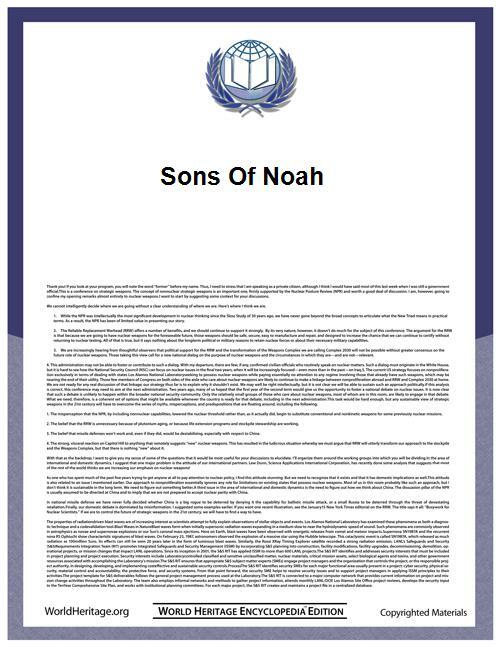 The Sons of Noah, or Table of nations, is an extensive list of descendants of the Flood because of the wickedness of the inhabitants, and Noah and his family were the sole eight survivors to continue and repopulate the human race. Thus the view of history in the Bible is that all humans on Earth are descended from Noah's family. There are disputes about how many of the peoples of the Earth this story was intended to cover, and as to its accuracy. The sons of Noah are not expressly mentioned in the Qur'an, except for the fact that one of the sons was among the people who did not follow his own father, not among the believers and thus was washed away in the flood. Also the Qur'an indicates a regional flood rather than a global one – A great calamity, enough to have destroyed Noah's people, but to have saved him and his generations to come. The names of these sons are thought to have significance related to Semitic roots. Shem merely means "name" or "renown", "prosperity". Ham means "warm". Japheth means "open". It then proceeds to detail their descendants in three groups, not in their birth order, but in the presumptive order they began to have sons after the flood.chapter 1 has occasional variations of spelling. Names ending in -im are plural in form. It is unknown if the respective progenitor was originally named with a singular form. Gomer, son of Japheth. Usually identified with the migratory Gimirru (Cimmerians) of Assyrian inscriptions, attested from about 720 BC. Ashkenaz, son of Gomer. It has been conjectured that this name arose from a misprint in Hebrew for "Ashkuz", by reading a nun for a vav. Ashkuz and Ishkuz were names used for the Scythians, who first appear in Assyrian records in the late 8th century in the Caucasus region, and at times occupied vast areas of Europe and Asia. Additionally, in Medieval Hebrew, Germany is known as Ashkenaz, and is the origin of the term Ashkenazic Jews. Riphath (Diphath in Chronicles), son of Gomer. Identification with Paphlagonians of later antiquity has been proposed, but this is uncertain. Togarmah, son of Gomer. Some Armenian and Georgian traditions have claimed descent from Togarmah; other authors have attempted to connect them with Turkic peoples. Magog, son of Japheth. This name appears in the Assyrian texts as mat gugu, The Land of Gugu, and means Lydia. Gugu is known in Greek texts as Gyges of Lydia, a historical king of Lydia and the founder of the Mermnad dynasty (ruled c. 716 - 678 BC). Is claimed as an ancestor in both Irish and Hungarian medieval traditions. Flavius Josephus, followed by Jerome and Nennius, makes him ancestor of the Scythians who dwelt north of the Black Sea. According to Johannes Magnus, Magog migrated to Sweden (via Finland) 88 years after the flood, and one of his sons was the first king of Sweden. His accounts became accepted by the Swedes, and the numbering of Swedish Monarchs was altered accordingly. Magog is also sometimes said to be the ancestor of the Goths, Finns, Huns, and Slavs. Madai, son of Japheth. The Medes of Northwest Iran first appear in Assyrian inscriptions as Amadai in about 844 BC. Javan, son of Japheth. This name is said to be connected with the Ionians, one of the original Greek tribes. Elishah, son of Javan. Identifications have been proposed with various Aegean peoples such as Elis of northwestern Peloponnesos, or Ellis of Phthia. Tarshish (Tarshishah in Chronicles), son of Javan. Has been variously connected with Tarsus in Anatolia, or Tartessus in southern Spain. Kittim, offspring of Javan. Usually connected with Kition in Cyprus, but name appears in other texts with a variety of interpretations. Dodanim (Rodanim in Chronicles), offspring of Javan. Usually connected with large Aegean island of Rhodes near the coast of Asia Minor. Note: the Greek Septuagint (LXX) of Genesis includes an additional son of Japheth, "Elisa", in between Javan and Tubal; however, as this name is found in no other ancient source, nor in I Chronicles, he is almost universally agreed to be a duplicate of Elisha, son of Javan. Nevertheless, the presence of Elisa (as well as that of Cainan son of Arpachshad, below) in the Greek Bible accounts for the traditional enumeration among early Christian sources of 72 families and languages, from the 72 names in this chapter, as opposed to the 70 names, families and languages usually found in Jewish sources. Tubal, son of Japheth. He is connected with Tabal, an Anatolian kingdom, and by way of the ancient tribe of the Tibareni both with the Iberians of the Caucasus and those of the Iberian peninsula (modern Spain and Portugal). Sometimes he is also seen as the ancestor of the Illyrians and Italics. In the book of Jubilees he was bequeathed the three 'tongues' of Europe. Meshech, son of Japheth. He is regarded as the eponym of the Mushki tribe of Anatolia. The Mushki are sometimes considered one of the ancestors of the Georgians, but also became connected with the Sea Peoples who roved the Mediterranean Sea. Tiras, son of Japheth. This name is usually connected with that of Thracians, an ancient nation first appearing in written records around 700 BC. It has also been associated with some of the Sea Peoples such as Tursha and Tyrsenoi, with the river Tiras (Dniester), and sometimes with the Anatolian region of Troas, dating to the later 13th century BC. In tractate Yoma, of the Talmud, it states that Tiras is Persia. Japheth is traditionally seen as the ancestor of Europeans, as well as some more eastern nations; thus Japhetic has been used as a synonym for Caucasians. Caucasian itself derives in part from the assumption that the tribe of Japheth developed its distinctive racial characteristics in the Caucasus, where Mount Ararat is located. The term Japhetic was also applied by the early linguists (brothers Grimm, William Jones, Rasmus C. Rask and others) to what later became known as the Indo-European language group, on the assumption that, if descended from Japheth, the principal languages of Europe would have a common origin, which apart from Uralic, Kartvelian, Pontic, Nakh-Dagestanian, and Basque, appears to be the case. In a conflicting sense, the term was also used by the Soviet linguist Nikolai Marr in his Japhetic theory intended to demonstrate that the languages of the Caucasus formed part of a once-widespread pre-Indo-European language group. Cush, son of Ham. The Empire of Kush to the south of Egypt is known from at least 1970 BC, but this name has also been associated by some with the Kassites who inhabited the Zagros area of Mesopotamia, the Sumerian city of Kish. Havilah, son of Cush. Usually considered to be a part of the Arabian peninsula near the Red Sea. Sabtah, son of Cush. Sometimes connected with Hadhramis (their ancient capital being Saubatha) in eastern Yemen. Raamah, son of Cush. Has been connected with Rhammanitae mentioned by Strabo in the southwest Arabian peninsula, and with an Arabian city of Regmah at the head of Persian Gulf. Sheba, son of Raamah. Has been connected with Sabaeans and peoples on either side of the narrowest part of the Red Sea. Dedan, son of Raamah. Apparently a region of the Tabuk Province of Saudi Arabia. Sabtechah, son of Cush. Possibly Sabaiticum Ostium, Sabaeans living around a Eritrea. Nimrod, son of Cush, also identified as a mighty hunter before God, and the founder of ancient Babel, Akkad, Sumer, and possibly cities in Assyria. The Hebrew wording of Genesis 10:11 has led to some ambiguity as to whether Asshur here is the son of Shem or a city built by Nimrod; either interpretation can be found in various modern versions. Mizraim, son of Ham. Mizraim is a name for Upper and Lower Egypt and literally translates as Ta-Wy in Ancient Egyptian ("The Two Lands"). The -aim in Mizraim represents dual number. Arabic-speaking modern Egyptians refer to their country as Miṣr. Ludim, offspring of Mizraim. Sometimes considered a scribal error for Lubim, a reference to the Libu of Eastern Libya. Anamim, offspring of Mizraim. There is a reference in an Assyrian inscription from Sargon II's time to Anami, a tribe located in Cyrene, Libya. Lehabim, offspring of Mizraim. Identification uncertain, possibly Libya. Naphtuhim, offspring of Mizraim. Has been connected with Na-Ptah, the Egyptian form of Memphis. Pathrusim, offspring of Mizraim. Possibly connected with Egyptian word Pa-To-Ris meaning southerners. Canaan, son of Ham. This is known to be the name of a nation and people who settled the Eastern shore of the Mediterranean in what is now called Israel and Lebanon and Syria. Sidon, firstborn son of Canaan, and name one of the oldest city-states on the Phoenician coast. Heth, son of Canaan, considered ancestor of "Hittites", a people of Canaan, possibly connected with Hatti, a powerful entity in Anatolia. "the Amorite", offspring of Canaan, a people living between the Jordan and Euphrates rivers by at least 2000 BC, known as Amurru to the Akkadians and Egyptians. "the Arkite", offspring of Canaan, probably city-state of Arqa in Phoenicia. "the Sinite", offspring of Canaan, possibly connected with the Wilderness of Sin, or the Sinn river in Syria. "the Arvadite", offspring of Canaan, refers to the Phoenician city-state of Arwad, now; inhabited island in Syria. "the Zemarite", offspring of Canaan, refers to the Phoenician city-state of Zemar. "the Hamathite", offspring of Canaan, refers to Syrian city of Hamath. Africans were thus anciently understood to be the sons of Ham, particularly his descendant Cush, as Cushites are referred to throughout scripture as being the inhabitants of East Africa, and they and the Yoruba still trace their ancestry through Ham today. Beginning in the 9th century with the Jewish grammarian Judah ibn Quraysh, a relationship between the Semitic and Cushitic languages was seen; modern linguists group these two families, along with the Egyptian, Berber, Chadic, and Omotic language groups into the larger Afro-Asiatic language family. In addition, languages in the southern half of Africa are now seen as belonging to several distinct families independent of the Afro-Asiatic group. Some now discarded Hamitic theories have become viewed as racist; in particular a theory proposed in the 19th century by Speke, that the Tutsi were supposedly Hamitic and thus inherently superior. The 17th-century Jesuit, Athanasius Kircher, thought that the Chinese had also descended from Ham, via Egyptians. Shem is traditionally held to be the ancestor of the Semitic people; Hebrews and Arabs consider themselves sons of Shem through Arpachshad (thus, Semites). In the view of some 17th-century European scholars (e.g., John Webb), the people of China and India descended from him as well. Elam, son of Shem. The Elamites called their land Haltamti and had an empire (capital Susa) in what is now Khuzistan, modern Iran. Elamite, however, is not a Semitic language. Ashur, son of Shem, associated with Assyria, Bangladesh, Tripura and other north-eastern states of India. Arpachshad, (also transcribed Arphaxad) son of Shem. He or his immediate descendants are credited in Second Temple tradition with founding the city of Ur of the Chaldees, usually identified (following archaeologist Woolley) with the Sumerian city of Ur on the south bank of the Euphrates. Lud, son of Shem. Most ancient authorities assign this name to the Lydians of Eastern Anatolia. Mash, son of Aram (1 Chronicles has Meshech). Cainan is listed as the son of Arpachshad and father of Shelah in some ancient sources. The name is omitted in the Hebrew Masoretic text of the Hebrew Bible, but the Greek Septuagint and genealogy of Jesus in St. Luke 3:36 include the name. Shelah (also transcribed Salah) son of Arpachshad (or Cainan). Peleg, son of Eber. In the table, it is said that the Earth was divided in the days of Peleg. A threefold division among Ham, Shem and Japheth preceding the Tower of Babel incident, is elaborated on in several ancient sources. Almodad, son of Joktan. According to Easton's Bible Dictionary "Almodad" means "immeasurable", however it has also been translated as "not measured", "measurer", "measure of God", "the beloved," or, "God is beloved", "God is love", and "God is a friend". Gomer: "those whom the Greeks now call Galatians, [Galls,] but were then called Gomerites". Aschanax (Ashkenaz): "Aschanaxians, who are now called by the Greeks Rheginians". Riphath: "Ripheans, now called Paphlagonians". Thrugramma (Togarmah): "Thrugrammeans, who, as the Greeks resolved, were named Phrygians". Magog: "Magogites, but who are by the Greeks called Scythians". Madai: "the Madeans, who are called Medes, by the Greeks". Javan: "Ionia, and all the Grecians". Elisa: "Eliseans... they are now the Aeolians". Tharsus (Tarshish): "Tharsians, for so was Cilicia of old called". He also derives the name of their city Tarsus from Tharsus. Cethimus (Kittim): "The island Cethima: it is now called Cyprus". He also derives the Greek name of their city, which he spells Citius, from Cethimus. Thobel (Tubal): "Thobelites, who are now called Iberes". Mosoch (Meshech): "Mosocheni... now they are Cappadocians." He also derives the name of their capital Mazaca from Mosoch. Thiras (Tiras): "Thirasians; but the Greeks changed the name into Thracians". Chus (Cush): "Ethiopians... even at this day, both by themselves and by all men in Asia, called Chusites". Evilas (Havilah): "Evileans, who are called Getuli". Sabathes (Sabta): "Sabathens, they are now called by the Greeks Astaborans". Judadas (Dedan): "Judadeans, a nation of the western Ethiopians". Mesraim (Misraim): Egypt, which he says is called Mestre in his country. "Now all the children of Mesraim, being eight in number, possessed the country from Gaza to Egypt, though it retained the name of one only, the Philistim; for the Greeks call part of that country Palestine. As for the rest, Ludieim, and Enemim, and Labim, who alone inhabited in Libya, and called the country from himself, Nedim, and Phethrosim, and Chesloim, and Cephthorim, we know nothing of them besides their names; for the Ethiopic war which we shall describe hereafter, was the cause that those cities were overthrown." Phut: Libya. He states that a river and region "in the country of Moors" was still called Phut by the Greeks, but that it had been renamed "from one of the sons of Mesraim, who was called Lybyos". Canaan: Judea, which he called "from his own name Canaan". Sidonius (Sidon): The city of Sidonius, "called by the Greeks Sidon". Amathus (Hamathite): "Amathine, which is even now called Amathe by the inhabitants, although the Macedonians named it Epiphania, from one of his posterity." Arudeus (Arvadite): "the island Aradus". Arucas (Arkite): "Arce, which is in Libanus". "But for the seven others [sons of Canaan], Chetteus, Jebuseus, Amorreus, Gergesus, Eudeus, Sineus, Samareus, we have nothing in the sacred books but their names, for the Hebrews overthrew their cities". Elam: "Elamites, the ancestors of the Persians". Ashur: Assyrians, and their city Niniveh built by Ashur. Arphaxad: "Arphaxadites, who are now called Chaldeans". Heber (Eber): "from whom they originally called the Jews Hebrews". Phaleg (Peleg): He notes that he was so named "because he was born at the dispersion of the nations to their several countries; for Phaleg among the Hebrews signifies division". "Elmodad, Saleph, Asermoth, Jera, Adoram, Aizel, Decla, Ebal, Abimael, Sabeus, Ophir, Euilat, and Jobab. These inhabited from Cophen, an Indian river, and in part of Asia adjoining to it." Aram: "Aramites, which the Greeks called Syrians". Uz: "Uz founded Trachonitis and Damascus: this country lies between Palestine and Celesyria". Mesa (Mesh): "Mesaneans; it is now called Charax Spasini". Laud (Lud): "Laudites, which are now called Lydians". The Chronicle of 354, the Panarion by Epiphanius of Salamis (c. 375), the Chronicon Paschale (c. 627), the History of Albania by the Georgian historian Movses Kaghankatvatsi (7th century), and the Synopsis of Histories by John Skylitzes (c. 1057) follow the identifications of Hippolytus. Thubal, son of Japheth: "Iberians, who are also the Spaniards from whom derive the Celtiberians, although certain people suppose them to be the Italians." Gether, son of Aram: "Acarnanii or Carians"
Magog, son of Japheth: "Scythians and Goths"
Ashkenaz, son of Gomer: "Sarmatians, whom the Greeks call Rheginians". Isidore's identifications for Japheth's sons were repeated in the Historia Britonum attributed to Nennius. Isidore's identifications also became the basis for numerous later mediaeval scholars, remaining so until the Age of Discovery prompted newer theories, such as that of Benito Arias Montano (1571), who proposed connecting Meshech with Moscow, and Ophir with Peru. In the view of some 17th-century European scholars (e.g., John Webb), the people of China and India descended from Shem. Both Webb and the French Jesuits belonging to the Figurist school (late 17th-early 18th century) went even further, identifying the legendary Emperor Yao of Chinese history with Noah himself. There exist various traditions in post-biblical sources claiming that Noah had children other than Shem, Ham, and Japheth — born variously before, during, or after the Deluge. According to the Quran (Hud v. 42–43), Noah had another unnamed son who refused to come aboard the Ark, instead preferring to climb a mountain, where he drowned. Some later Islamic commentators give his name as either Yam or Kan'an. According to Irish mythology, as found in the Annals of the Four Masters and elsewhere, Noah had another son named Bith, who was not allowed aboard the Ark, and who attempted to colonise Ireland with 54 persons, only to be wiped out in the Deluge. Some 9th-century manuscripts of the Anglo-Saxon Chronicles assert that Sceafa was the fourth son of Noah, born aboard the Ark, from whom the House of Wessex traced their ancestry; in William of Malmesbury's version of this genealogy (c. 1120), Sceaf is instead made a descendant of Strephius, the fourth son born aboard the Ark (Gesta Regnum Anglorum). An early Arabic work known as Kitab al-Magall or the Book of Rolls (part of Clementine literature) mentions Bouniter, the fourth son of Noah, born after the flood, who allegedly invented astronomy and instructed Nimrod. Variants of this story with often similar names for Noah's fourth son are also found in the c. 5th century Ge'ez work Conflict of Adam and Eve with Satan (Barvin), the c. 6th century Syriac book Cave of Treasures (Yonton), the 7th century Apocalypse of Pseudo-Methodius (Ionitus), the Syriac Book of the Bee 1221 (Yônatôn), the Hebrew Chronicles of Jerahmeel, c. 12th–14th century (Jonithes), and throughout Armenian apocryphal literature, where he is usually referred to as Maniton; as well as in works by Petrus Comestor c. 1160 (Jonithus), Godfrey of Viterbo 1185 (Ihonitus), Michael the Syrian 1196 (Maniton), Abu Salih the Armenian c. 1208 (Abu Naiţur); Jacob van Maerlant c. 1270 (Jonitus), and Abraham Zacuto 1504 (Yoniko). Martin of Opava (c. 1250), later versions of the Mirabilia Urbis Romae, and the Chronicon Bohemorum of Giovanni di Marignola (1355) make Janus (i.e., the Roman deity) the fourth son of Noah, who moved to Italy, invented astrology, and instructed Nimrod. According to the monk Annio da Viterbo (1498), the Hellenistic Babylonian writer Berossus had mentioned 30 children born to Noah after the Deluge, including sons named Tuiscon, Prometheus, Iapetus, Macrus, "16 titans", Cranus, Granaus, Oceanus, and Tipheus. Also mentioned are daughters of Noah named Araxa "the Great", Regina, Pandora, Crana, and Thetis. However, Annio's manuscript is widely regarded today as having been a forgery. Kautzsch, E.F.: quoted by James Orr, "The Early Narratives of Genesis," in The Fundamentals, Vol. 1, Los Angeles, CA, Biola Press, 1917.
: Entry for "Genealogy" - a 1901/6 view (the early days of comparative linguistics and the documentary hypothesis). The connection of modern nations to the table according to a creationist source (with Europe as descended from the tribes of Israel, and the UK and USA from Joseph (but by different sons)).
. A more standard creationist account that associates Japheth with Europe.